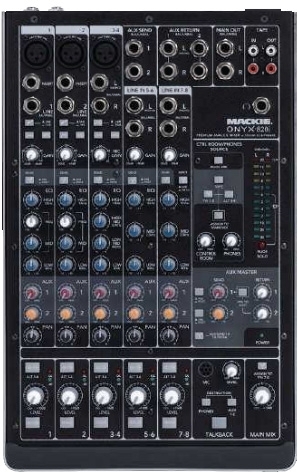 It's been a while since the first Onyx mixers with the FireWire option first came out, and now Mackie carries on with the Onyx 820i, which comes with Pro Tools M-Powered. Hmm...so what does M-Audio think about that? We like the overall design of the mixer, and the aluminum chassis gives it a sturdy and classy look, which is a very good point considering it's an entry-level mixer. The plastic knobs–from the solo and mute buttons to the EQ controls–will be familiar to all Mackie users. The mixer's compact dimensions (14.2" x 9" x 3.8") and weight (9.7 lb.) 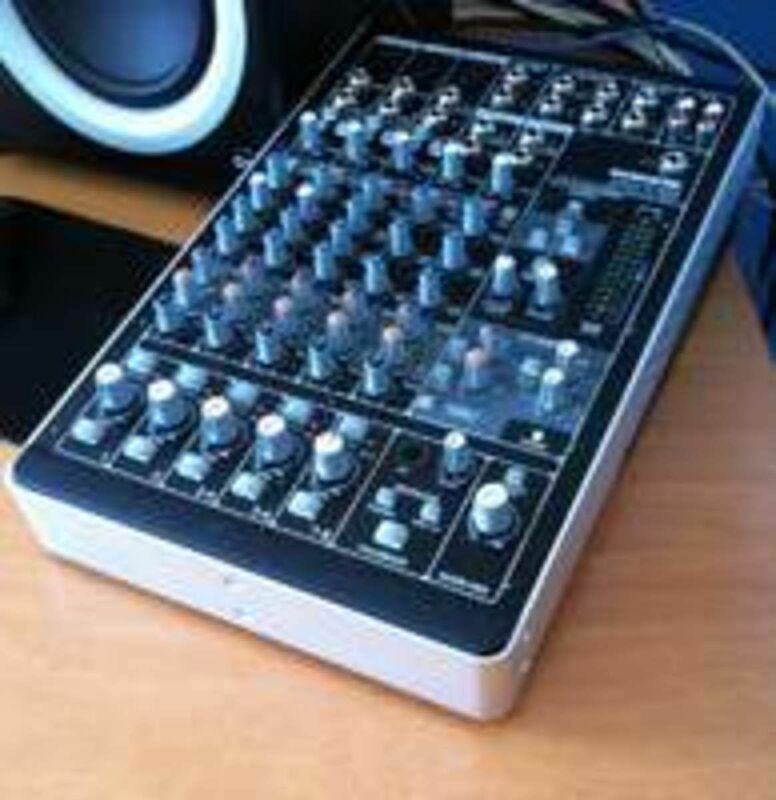 make the mixer seem sturdy. We'll have to see if this holds true under real-life conditions. It also has four rubber feet on the bottom side so it's a mixer that will surely stay in place. 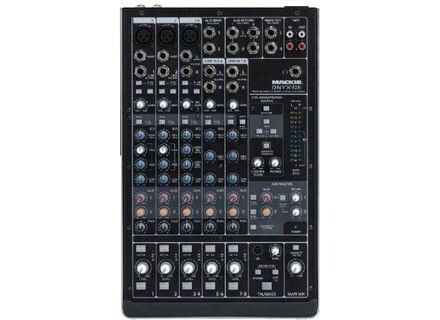 The mixer has eight channels: the first two are mono and include XLR mic inputs, 1/4" jack line inputs which accept balanced/unbalanced signals, and switchable instrument inputs (via a dedicated switch) that allow you to connect an electric or bass guitar directly to the mixer. A 75 Hz low-cut filter and 48V phantom power for condenser mics are also provided. The gain control ranges from -20dB to +40dB, allowing you to set the level of your input signal, and a red "OL" LED indicates signal overload. The -20dB green LED turns on when the input signal exceeds this threshold. 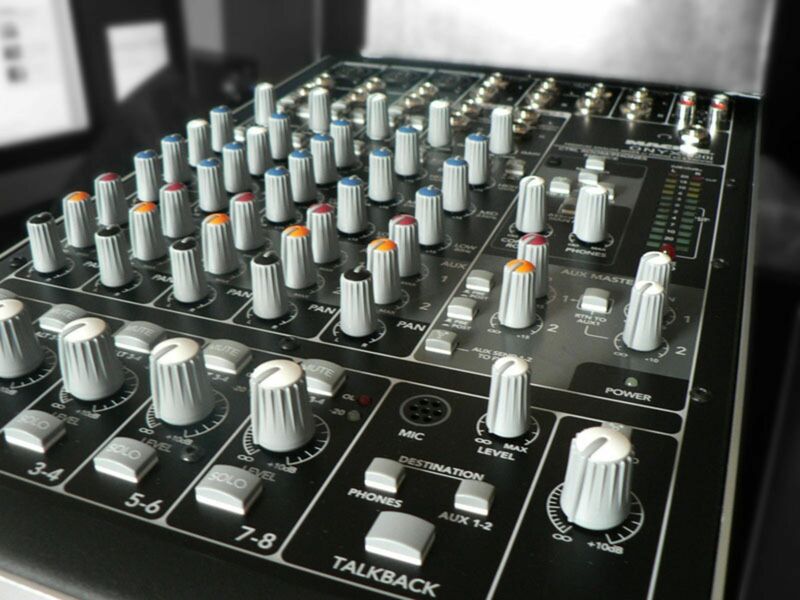 It's certainly not enough for a precise level setting, but, unfortunately, that's something most compact mixers lack–for price and size reasons. The EQ is three band with semi-parametric mids, meaning you can set the center frequency for the mid band. The high and low bands have shelving filters set to 12 kHz and 80 Hz respectively. The mid band has a peak filter with sweepable center frequency from 100 Hz to 8 kHz. The choice of frequencies available should work fine with vocals. An interesting feature allows you to tap the FireWire output pre or post-EQ. One of the main cons of the 1220 we previously tested was that you couldn't record the signal processed with the mixer's EQ to your computer. It's a real pity, considering the EQ is rather good! With the 820i, you now have the possibility to choose to record the signal with or without the Onyx EQ. Mackie corrected its mistake from the former series: well done! Below the EQ are the two aux sends, whose physical outputs (on balanced/unbalanced 1/4" jacks) are underneath channel 5-6. The stereo aux returns are also on 1/4" jacks. You'll also find pan and level controls, as well as mute and solo buttons. 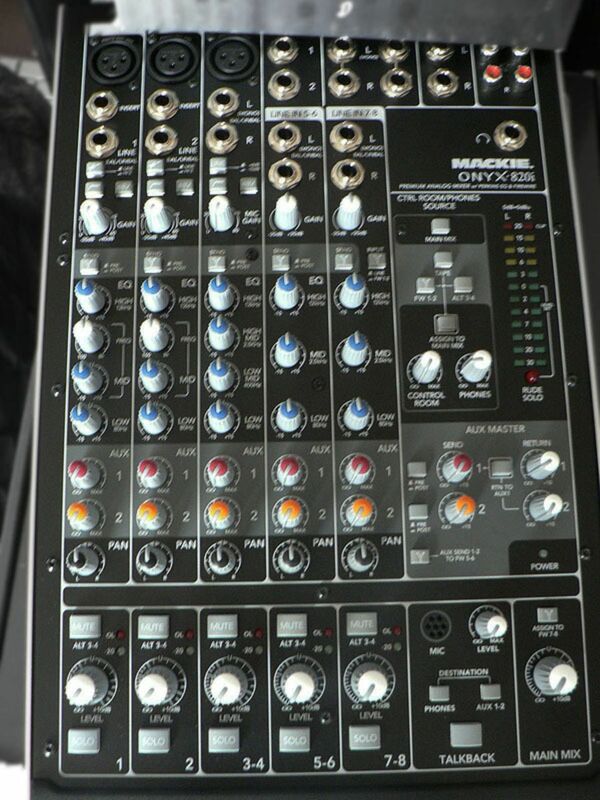 Unfortunately, due to space constraints, this Mackie has no level faders, what a pity! But that seems to be the only thing missing. Channel 3-4 can be used either as a mic/line level mono channel or as a line level stereo channel. Instead of the semi-parametric, three-band EQ of the first two channels, you have a four-band EQ with four fixed filters (low-mids at 400 Hz and high-mids at 2.5 kHz), and a level switch allows you to select the input level (-10 dBV or +4 dBu). Channels 5-6 and 7-8 are identical except for the fact that you can assign FireWire outputs 1-2 from your computer directly to channel 7-8 using a small button next to the EQ. The latter includes a 3-band EQ (fixed at 2.5 kHz for the mids) and balanced/unbalanced 1/4" jack line inputs. Input gain ranges from -20dB to +20dB. 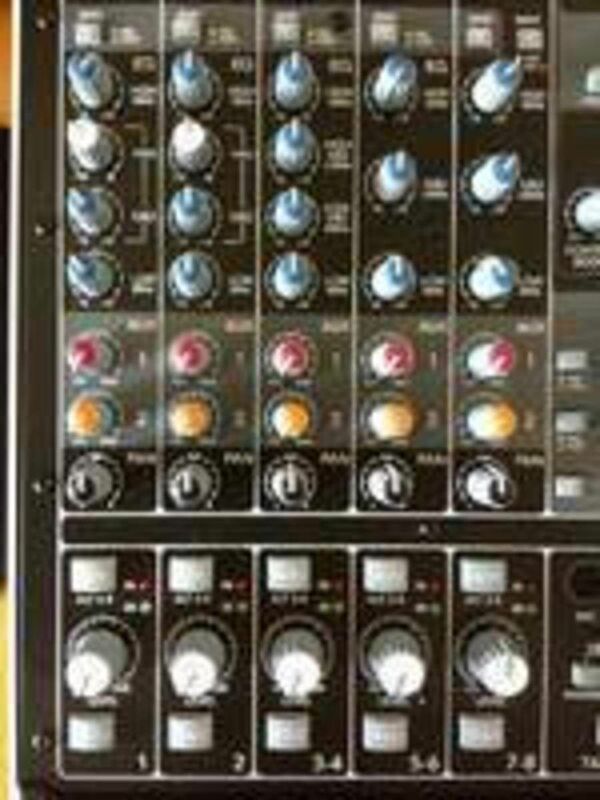 The mixer has several physical busses and outputs: main mix assigned to two XLR outputs on the rear panel, main out on 1/4" jacks, Firewire channel 7-8 (to mix down directly to your computer simply by pressing the corresponding button), and tape outputs on RCA jacks. The Control Room bus is routed to the balanced/unbalanced control room 1/4" jack outputs on the rear panel, and to the phones output. The alt 3-4 outputs (also on 1/4" jacks) allow you to create an alternate mix. To assign a channel to alt 3-4 you just have to engage the channel's mute switch. By doing so, the signal disappears from the main mix and is routed to the alt 3-4 bus. This function is very useful for lots of applications, for example, if you need to check your signal sources before assigning them to the F.O.H (main mix) during a live show. To select the source(s) assigned to the control room/phones bus use the mixer's source matrix. Both have independent level controls but common sources. 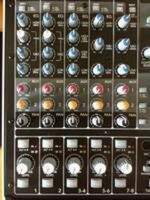 You can assign the main mix, RCA tape input, FireWire channel 1-2 (straight from the computer), and alt 3-4 signals to the source matrix. You can also assign the control room signal to the main mix, in which case you'll obviously won't be able to hear the main mix signal in the control room. Whenever a solo switch is engaged you will only hear the soloed channel in the control room; the soloed channel is not assigned to the main mix, which will still work normally. This means you can listen to any sound source with your headphones before assigning it to the main mix. The talkback section has a built-in mic and a volume control. While holding down the talkback switch you will be able to hear your lovely voice through the phones or the aux send 1 and 2 outputs. The aux sends can be either pre-fader (for monitoring) or post-fader (for effects)–even if the mixer doesn't have any actual faders (but volume potentiometers)–, and you have a level knob for each aux send and return. Pre-fader means post-EQ, but you can have this modified at Mackie authorized service centers in case you want a pre-EQ aux send. There is also a "RTN to AUX 1" switch to assign aux return 2 to aux send 1, which can come in very handy if, for example, you want to send some of the reverb from aux 2 to the monitors on stage connected to aux 1. A last switch allows you to assign a copy of aux sends 1-2 to FireWire channel 5-6, so you can actually use a plugin from your sequencer in the aux bus of the Onyx mixer. Thanks to the FireWire connection you can send each individual channel, a copy of aux send 1-2 and the main mix signal to your computer. However, you will only have two output channels from your sequencer available, which can be routed to the control room bus or channel 7-8 of the mixer. If you choose the latter, you can use the Onyx EQ, pan, gain, and volume controls to process the sound coming from your computer, just like any other analog signal. It would be nice to have more outputs from the computer... It's a pity but we'll make do! Last but not least, each FireWire channel output can be set pre or post-EQ, as explained above; but what about inserts and faders? The FireWire channel is pre-insert and pre-EQ, or pre-fader and post-EQ. For those of you who read this far: don't panic, this can be modified if you go to a Mackie authorized service center. So everyone can have a mixer that matches their own needs, even if that means having to deal with Mackie's somewhat frustrating technical service. 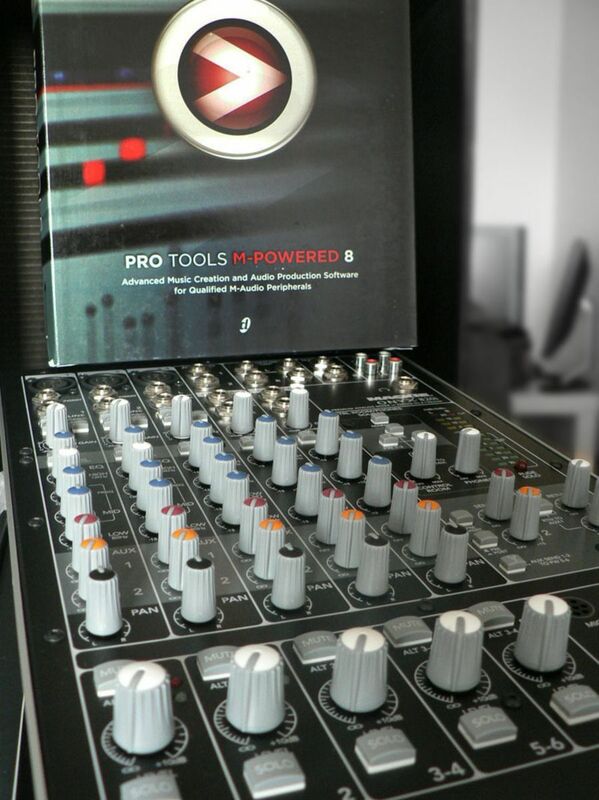 Installation of the Universal Driver was easy and we had no problems using the FireWire interface with Logic Studio 8. All inputs (8) and outputs (2) were readily available in the sequencer. In order to test the preamps, Perkins EQ and converters of this small Onyx, we recorded a Garrison acoustic guitar with a DPA 4099 mic. The first takes have no EQ but the second ones do. We obviously recorded everything with ProTools! You may find the wave files in the media files section. The preamps' headroom is somewhat limited so we had to tweak the gain almost to its limit! Lots of budget and mid-priced audio interfaces have this same problem: an exponential gain curve that makes it pretty hard to get precise settings with low-level signals and also adds too much noise with high gain settings. In the preamp's defense we should add that the output level of the mic we used is pretty low. On the other hand, the EQ is very effective and sounds quite good! The converters seem to be alright, considering the price tag on the mixer. And speaking of price, the best thing about the 820i is its price, which is considerably lower compared to the previous Onyx mixers with FireWire.